The 7D DarkRide Experience at Pier 39 is an interactive motion theater and video game combo that immerses the rider in an action-packed environment. With selections that include 'Zombies,' 'Road Fighters,' 'Gigamon,' and 'Los Banditos,' there is a 10-minute option for every member of the family. Choose your own adventure, then buckle up and grab a laser blaster for for a virtual reality quest to take down your opponents. The 7D Experience DarkRide is a great option for kids and adults alike while exploring the attractions of Pier 39 in San Francisco. Upon arrival, select your 10-minute ride experience, available any day of the week during opening hours. Choose from several exciting ride options including Zombies, Road Fighters, Gigamon, and Los Banditos. Before entering the state-of-the-art, 20-seat DarkRide XD theater, you'll watch an informative video. After this short introduction, fasten your seat belt and put on your 3D glasses then let the excitement begin. 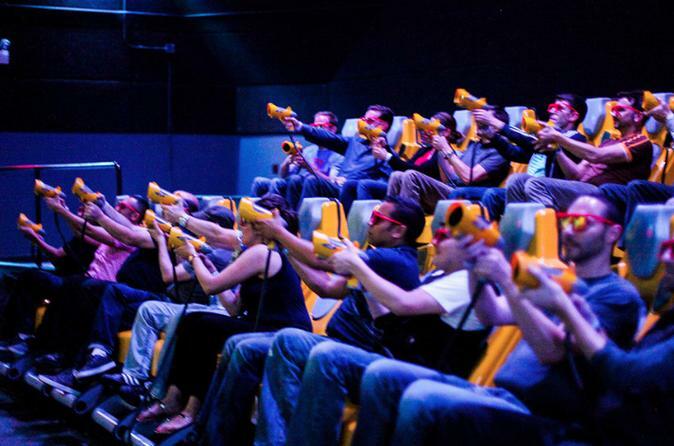 While the seats move along to the action on the high-definition screen, use your own laser blaster to fight virtual-reality zombies, monsters, or bandit robots. Compete with other players to earn the highest score. With accurate score keeping and an onscreen photo reveal, each player will know their score at the end of the game.